Atlantico 44. 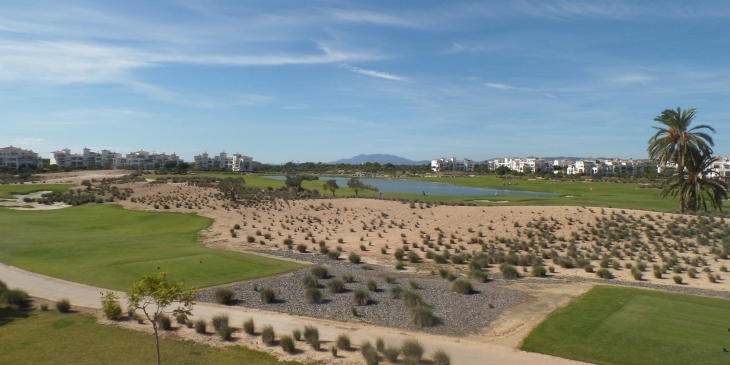 LUXURY 2 Bedroom apartment 15 mins from the sea, this five star resort has supermarket, restaurant and bars on site, plus a Jack Nicklaus designed 18-hole golf course. With a large swimming pool on your doorstep. Just Picture Yourself With A Cold Chilled Glass Of Wine Or Beer Whilst Sinking Into Your Comfy Outdoor Sofa On Your Exclusive First Floor Balcony After A Long Day Of Sun Bathing Around Your Large Communal Pool Or While Reflecting On An Enjoyable Round Of Golf On The Jack Nicklaus Championship Course. You Can Let All Your Stresses And Anxiety Wash Away Watching The Beautiful Murcian Sunset Fade Away Across The Two Fairways Right Outside Your Door Until It Disappears Behind The Distant Mountains. The living room is equipped with a brand new 32′ LCD TV with a large choice of English language channels. For your entertainment there is also a DVD player, CD player, IPOD speakers and a PS2 with games. The kitchen is equipped with dishwasher, washing machine, fridge-freezer, oven, hob, kettle, toaster, and microwave. It has a master bedroom fitted with a double bed, and second bedroom with two single beds. Both bedrooms have a built-in wardrobe and french windows leading to the terrace at the rear of the property where there is a small table and two chairs. The apartment has a spacious front terrace (with sofa, chairs and table) overlooking the large swimming pool. The property is equipped with air conditioning and central heating. There is underground parking for one vehicle with access to the apartment via a lift or stairs. As a resident you will have access to all the resort facilities including swimming pools, outdoor gym, tennis and paddle tennis courts. Golfers staying at the resort can take advantage of the residents’ green fees which represent a significant saving on the normal rates.